We’d love your help. 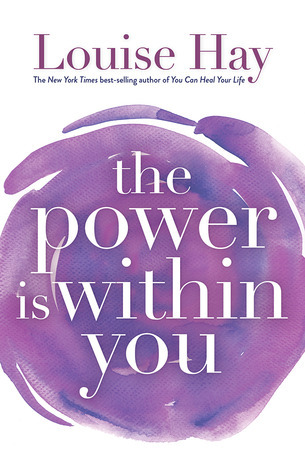 Let us know what’s wrong with this preview of The Power Is Within You by Louise L. Hay. To ask other readers questions about The Power Is Within You, please sign up. "...the simple things are usually the most profound." Sometimes a book politely taps you on the shoulder, and says "here I am". For me, this was the right book at the right time. 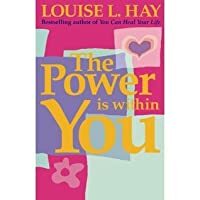 While "self help" books are no longer new and have become somewhat of an over-inflated phenomenon, it's nice to get back to one from an Author with integrity like Louise Hay. I've read many of Louise Hay's books over the years, and find that her warmth and empathy shine through. For me, so much of what she writes makes sense re: the mind-body connection. While many sections of this book didn't apply to me at all, the ones that did were well worth spending time to ponder over. It's good to slow down and take stock , to re-evaluate what's important, what's working. And what isn't. Are we where we want to be? And if not, why not. What's holding us back, and what are we doing about it? Pause, reflect, re-wind, re-start. Breathe. There's such a beautiful piece in the book where Louise suggests how marvelous it would be if teddy bears were given to all children in hospital. So that when they felt lonely or frightened, they would have a teddy to cuddle and make them feel safe. That was so poignant for me, as I recently had a dear friend have an unexpected hospital stay, and she mentioned how nice it would have been to have a "cuddle buddy" with her when friends and family had gone home. So teddy bears for everyone I say! This book has a quiet positivity running through it, without being saccharine sweet or wishy washy. It simply asks us to dig deep. let go of regrets, be grateful for what we have, and to be kinder to ourselves and others. Our minds and thoughts have such an impact on our daily lives. It's quite inspiring to think that though Louise Hay is no longer with us, her words continue to be read, absorbed and paid forward. That's got to be a good thing. A solid 3.5★ from me. This is basically a simplistic version of The Power of Your Subconscious Mind so I rather enjoyed it! The premise itself is simple: Change your thoughts, and you can change your life. It's about not seeing yourself as a victim but learning from every experience, whether good or bad. It promotes gratitude, and the notion that what you put out into the universe comes back to you in kind, often magnified. So if you treat people like crap, guess how you're going to be treated? I love this idea that our This is basically a simplistic version of The Power of Your Subconscious Mind so I rather enjoyed it! I love this idea that our thoughts are the driving force behind what happens in our lives, and I work actively to alter mine every day. It's not about not having bad thoughts, but being able to recognise and alter them. You don't have to be perfect, you just have to want to be better. One thing I noticed, though, is that this book assumes a lot about the reader, which I can see has been influenced by the author's own circumstances. The book seems to be aimed at an older readership - 50+ I would say. It does cover how to nurture children (skimmed it) but for the most part it seems to target that older readership. It also seems to assume that every reader had a troubled childhood, with horrible parents. I found it really difficult because my childhood was actually pretty good, and my parents have been such incredibly supportive, loving role models. I've certainly overcome obstacles in my life, but I like to think I can still be a better person without having to overcome a dark past. Without question, this is one of the most indispensable books for anyone interested in reclaiming the control over their lives. Like most of her works, Louise brings her clarity, wisdom and consciousness to the reader in a way that makes New Thought accessible and relevant, regardless of one's path, background or spiritual heritage. Her pragmatic insights, anecdotes and recommendations have been a soource of inspiration and healing for me, and for hundreds of my students. I've given away dozens of Without question, this is one of the most indispensable books for anyone interested in reclaiming the control over their lives. Like most of her works, Louise brings her clarity, wisdom and consciousness to the reader in a way that makes New Thought accessible and relevant, regardless of one's path, background or spiritual heritage. I have learned so far so much about myself and my responses or non-responses to the past pain in my life - if you are experiencing depression, addiction, or grieving the loss of a loved-one, this is a book worth reading. This book has given me strength in my life more times than I wish to admit. This time is no different. This is one of those books that you have to reread periodically in certain stages of your life, just to remind yourself how strong you are and that nothing can actually take you down or make you feel down, despite you - yourself! I truly believe in the amazing power of positive thinking, although I have to admit, sometimes in life it's just easier to stick to the bad. I'm so glad Louise wrote th This book has given me strength in my life more times than I wish to admit. This time is no different. I truly believe in the amazing power of positive thinking, although I have to admit, sometimes in life it's just easier to stick to the bad. I'm so glad Louise wrote this book as a constant reminder that it doesn't take much of an effort to change the course of events happening around you in the positive direction. And I assure you this absolutely works no matter how weird this might sound. I have experienced this amazing power in my life not once, and I truly needed to turn to it at this moment I find myself in right now. I wish everyone could read and follow the advices given in this book and really stick to the positive rather than the negative. And I support Louise's words that this should be studied in school before everything else. The world would be a better place this way. And I believe it's up to all of to make it one, for us and for everyone around us. This brings back in my mind the words of a Michael Jackson song Man in The Mirror saying: "If you wanna make the world a better place, take a look at yourself and make that change..."
وبما أني من الناس الذين يكبتون غضبهم لم أَجِد إجابة مناسبة لديهم .. لكن في هذا الكتاب وجدت ما أبحث عنه. لكن بالأخير استمتعت جدا معها. لم يكن كتابا يغمره التفاؤل بل كان للحزن و للخيبة جزءا كبيرمنه و مع هذا كان لطيفا و إن لم يقدم لي الكثير. "الطبعة دي فيها أخطاء أملائية كتيرة ودي اكتر حاجة كانت مضيقاني"
مقدمة الكتاب تُعطي مُرونة في تقبل ما يحتويه أو نقده أو حتى رفضه..
الكتاب على بساطته وعدم عمقه إلا أنه إضافة جيدة لمن يبحث عن فتح الطرق المؤدية إلى ذاته. يحتوي على نصائح وتعليمات لا يصعب تطبيقها أو الأخذ بها. قد تكون بعض الفقرات لهجتها سلبية تجاه الأهل، وقد يكون ذلك مستقهما من الكاتبة.. خصوصاً أنها أشارت مراراً وتكراراً لما عانت منه في طفولتها، ولكنها لم تكن سوى كلمات أتت في السياق لا تؤثر على هدف الكتاب ولا تُجبر القارىء أن يقبلها ويعممها. اضافة جيدة للقارئين في مجال التنمية الذاتية والتنمية البشري مقدمة الكتاب تُعطي مُرونة في تقبل ما يحتويه أو نقده أو حتى رفضه..
1.Look at the mirror and say "I love you" to yourself. 3.Realize your strenght parts and enhance it. 5.Be thankful to the things you dont like so that there will be something better. 6.Doubt is not an enemy,its a friend. As i said before I love Louise is always honest and not commercial-like famous gurus and i love her for that. 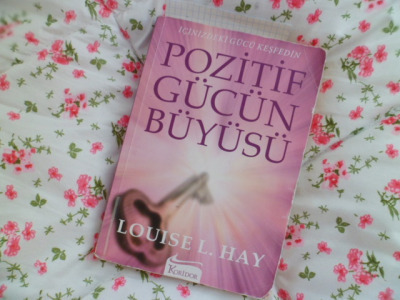 Louise L. Hay é uma autora de livros de desenvolvimento pessoal muito conhecida e cujo método inspira milhões de pessoas por todo o mundo. Assenta numa pedra basilar muito simples: amarmo-nos a nós próprios e difundir esse amor incondicional pelo que nos rodeia. Pensar positivo, ter uma atitude positiva e emocionalmente equilibrada pode ajudar a enfrentar o dia-a-dia com mais serenidade e ajudar a crescer emocional e espiritualmente, a ingressar numa viagem interior gratificante. "Os astrólogos Louise L. Hay é uma autora de livros de desenvolvimento pessoal muito conhecida e cujo método inspira milhões de pessoas por todo o mundo. Assenta numa pedra basilar muito simples: amarmo-nos a nós próprios e difundir esse amor incondicional pelo que nos rodeia. Pensar positivo, ter uma atitude positiva e emocionalmente equilibrada pode ajudar a enfrentar o dia-a-dia com mais serenidade e ajudar a crescer emocional e espiritualmente, a ingressar numa viagem interior gratificante. أقرّ أنّ أفكارها -كما وَصفَتها في ملخص الكتاب- شافية، رسّخت فيّ معاني الحبّ والعطاء اللامحدود وقدرة الإنسان على التغيّر إلى النحو الذي يطمح مهما كان ماضيه، ومهما مرّ بظروف قاسية. أزعجتني الأخطاء الإملائية وأخطاء الطباعة الكثيرة، لو أُعيدت ترجمة الكتاب بعيداً عن الترجمة الحرفية التي قرأتها؛ لصار أكثر تشويقاً ولكانت الأفكار أكثر ارتباطاً وتسلسلاً. What i like about Louise Hay books are its simplicity writings and personal feelings i get reading them. I have read " How to Heal Your Life" prior to this and i feel that this book is an extension or a supplement reading to it. I have enjoyed it and i hope you do to. I absolutely adore Louise Hay's books. There are my go to in rough times and they always find me when I need them the most. I believe, if everyone on this planet would read her books, the world would be a better place. Enlightening, powerful and a must- read for everyone. Con el 8% de este libro, algo más de 20 páginas, he tenido suficiente para descubrir que se trataba de una sarta de tonterías sin sentido. To Con el 8% de este libro, algo más de 20 páginas, he tenido suficiente para descubrir que se trataba de una sarta de tonterías sin sentido. Todos tenemos un superpoder especial dentro de nosotros que es el amor a nosotros mismos. Este superpoder es capaz de todo una vez que lo descubrimos y desarrollamos. Puede hacer que consigamos el trabajo soñado, que nunca nos falte el dinero y aún más, nos cura o aleja de las enfermedades. Los problemas del mundo se deben a la falta de amor por nosotros mismos. Si todos nos amáramos no habría guerras ni hambre, ni SIDA, ni cáncer. Si te pasa algo, si tienes algún problema o circunstancia negativa en tu vida. Has de saber que no se debe a circunstancias externas, es tu propia culpa, tu falta de amor a ti mismo, tu incapacidad para desarrollar tu superpoder. No pidas ayuda, eso te sitúa en un papel de víctima, incluso pedir ayuda a un médico porque estás enfermo es un contra sentido. Recuerda el poder está dentro de ti. A parte de las risas que uno se puede echar leyendo estas cosas, también se siente cierta sensación de nausea en el estómago cuando una vez más te cruzas con uno de estos autores hijos del neocapitalismo. Ese que destruye el estado del bienestar y la idea de solidaridad que subyace bajo él. Todo lo que le ocurre al ser humano es su propia culpa. Si no tienes trabajo, educación o una enfermedad es exclusivamente culpa tuya y por lo tanto el estado u cualquier otra entidad no debería ayudarte. Tú deberías ser capaz de resolver tus propios problemas. Okay, There are many good tips and many good Affirmations, But one thing that put me off was citing examples about 'Cancer' after every few pages. If Louise Hay is a believer that , whatever we read, see , and think about is what we attract, this book is going to make many readers cancer prone. If you can just ignore all those pages that have references to cancer , this is a good book. The Last Few Pages are very well written , especially , the Appendix, where there is a summary of every chapter Okay, There are many good tips and many good Affirmations, But one thing that put me off was citing examples about 'Cancer' after every few pages. 4.5 stars. Audio read by the author, Louise Hay. I love her gentle and soothing voice. A companion book of sorts to You Can Heal Your Life as it reaffirms the lessons learned in it and provided you with a few more. A good friend of mine told me about this book, so I knew more-or-less what to expect. I was vaguely familiar with the idea of affirmations and Louise Hay's methods. I have to say there were portions of this book that seemed a bit far-fetched (e.g. the idea about incarnation), but I decided that I would suspend my disbelief and just let it speak to me in its own way, in its own words. The idea about loving ourselves and garnering the power that is deep within us is not entirely unfamiliar, but th A good friend of mine told me about this book, so I knew more-or-less what to expect. I was vaguely familiar with the idea of affirmations and Louise Hay's methods. I have to say there were portions of this book that seemed a bit far-fetched (e.g. the idea about incarnation), but I decided that I would suspend my disbelief and just let it speak to me in its own way, in its own words. The idea about loving ourselves and garnering the power that is deep within us is not entirely unfamiliar, but this time it truly resonated with me. As I was reading the book I let this idea simmer in my head and I also kept a journal to see what comes bubbling up to the surface. Many ideas came forth and I am thankful for them. (Yes, that is one thing this books taught me - gratefulness.) I am very curious to see what it yields in the months to come. I believe this is the kind of book that opens up a door, perhaps only ajar, but that is quite enough. It probably works just like any affirmation - it has planted its seeds in me and now it grows. I like the person who is Louise Hay. She is a fantastic public speaker, charismatic and relatable, warm and strong. After having listened to one of her CD's my granny lent me this book. Perhaps my expectation was too far removed but I thought the whole thing fluffy and somewhat tiresome to get through. She writes as she speaks, which is fine but not what I was searching for at that particular time. Her principals are idealistic. A more helpful starting point would be to embrace the negative as we I like the person who is Louise Hay. She is a fantastic public speaker, charismatic and relatable, warm and strong. After having listened to one of her CD's my granny lent me this book. Perhaps my expectation was too far removed but I thought the whole thing fluffy and somewhat tiresome to get through. She writes as she speaks, which is fine but not what I was searching for at that particular time. Her principals are idealistic. A more helpful starting point would be to embrace the negative as well as positive aspects of ones life rather than take the view that as long as you think correctly your existence will be abundant. I liked her idea of taking care of the inner child - that is the main thing I was able to take away from the book. And in the end, if we take one thing that stays with us, the effort was always worthwhile. I personally found this book to be very inspirational, it has made me realise how unique, beautiful and powerful we really are. To sum it up, by the end of the book, I felt like the world was my oyster. It is the sort of book that I would read again in the future - and still get something from it. The power is within you is like cleaning for the soul. Even if you don't like or agree with everything she does or thinks, you'll still be touched. I wish everyone would take a day and read this book. You feel positive energy while you reading it. While I enjoyed some of the ideas of Louise Hay, others were a bit strange to me (probably because the author is a member or follower of Religious Science). I still took away some good advice from the book. the biggest inspiration is here! I feel really relaxed when I read it!